The Caravan Aluma 10 feet by 15 feet Canopy with Professional Top is part of a larger series from this established manufacturer that offer a few unexpected benefits for outdoor shelter shoppers. Almost everyone expects quality and dependability from Caravan as a company, but this shelter and others in the Aluma series have a few attributes many people aren't familiar with. We'll discuss all of this tent's features below. First of all, the frame is made of anodized industrial grade aluminum, meaning that it is extremely durable in addition to being rust-resistant. The tent top is constructed from professional 500 denier polyester that will keep you and your guests protected from wind, rain, and potentially harmful UV rays as you enjoy the outdoors from underneath it. And, like all Caravan canopies, this one is extremely strong, extremely stable, and easy to set up and take down. Many people don't consider just how great the weight savings are with an aluminum frame. The anodized aluminum used in this shelter save you a minimum of 30 percent of the total frame weight when compared to any steel frame of a tent of similar size. You may also be unaware that this shelter offers an unparalleled level of resistance to salt air and water corrosion, making it a favorite of people who live on or near salt-water coastal areas. Lastly, the unique leg design includes five available height settings that allow you to customize your tent to suit any gathering. The highest of these settings offers seven feet of clearance beneath the tent top - a figure that is tops in the industry. All sorts of tents offer all sorts of unique qualities. In that sense, this one is no different. But it is entirely different when you think about the overall combination of function, value, and features that you're not likely to find in other shelters. 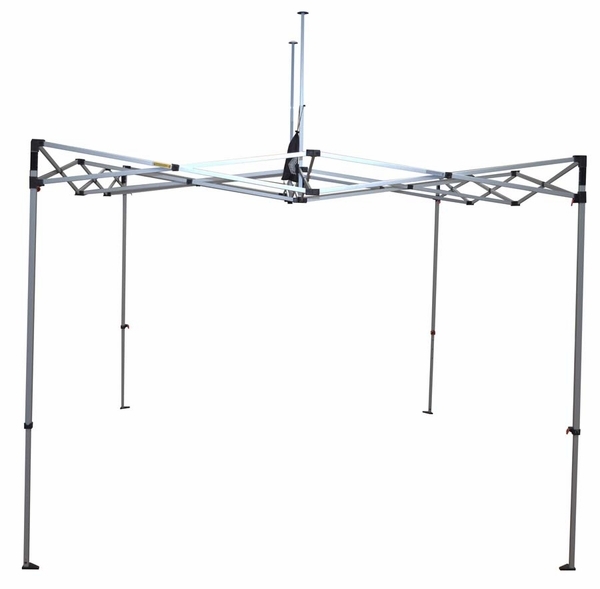 When weighing the many choices available to provide useful, lasting shelter for your upcoming outdoor events, consider the idea that the Caravan Aluma 10 feet by 15 feet Canopy with Professional Top offers a nearly unbeatable mix of weather-resistance, convenience, and bang for your outdoor buck. WARNING: This product can expose you to chemicals including Diethylhexyl Phthalate, which is known to the State of California to cause cancer, birth defects, or other reproductive harm. For more information go to www.P65Warnings.ca.gov. How much would it be to put the school name on two sides of this canopy? So that we may provide the most accurate quote to you, please visit our Canopy Custom Graphics Quote Form. I am going to leave this up year round in California. 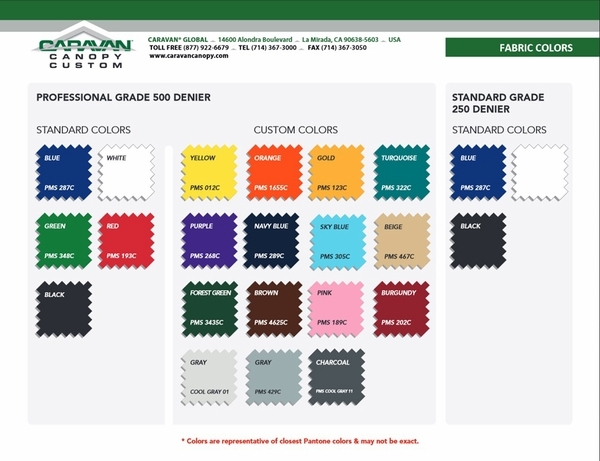 What is the most durable material top? This type of canopy is not meant to be used in this type of application. One of our frame or pole tents would be more ideal, as they will hold up to the elements better than pop up canopies, which are meant to be taken down in high winds or rain. For what you are trying to accomplish, I will recommend the Premier West Coast 10 X 15 Frame Tent. What comes with this product when you buy it? Are there any stakes or a carry bag? What about sidewalls? If you order a custom color like navy blue, does it still ship in 1-2 days? 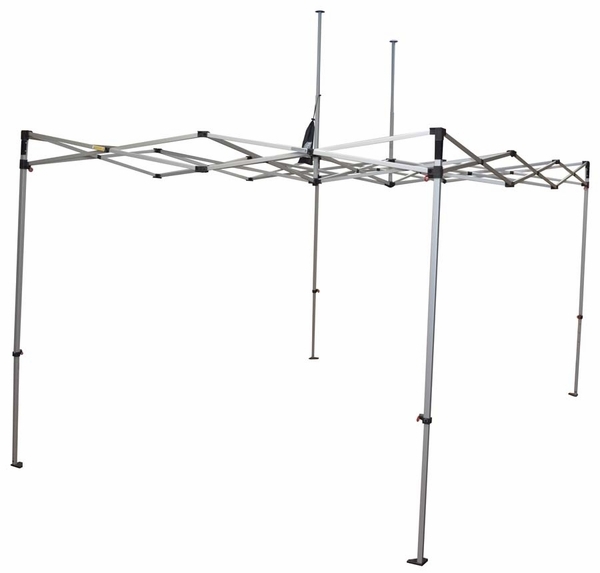 This canopy includes just the frame and top; no sidewalls, stakes or roller bag. These options can be found in the "Accessories" tab on this item page. Most custom colors like navy blue will take an additional 3-5 business days before shipping, as these tops are sewn on order. How wide are the legs on the 10x15? The leg diameter on this model is 1-1/4". We have purchased the Caravan Canopy for use at the San Francisco Farmer Market. It is very well built and we are very happy. We could have purchase a Canopy for less money but it would not have held up to our weekly use. ProsI think it is a great canopy. The quality of this canopy is fantastic. The structure is solid and the canopy material is excellent. It is strong enough to move the canopy with four people holding each leg. 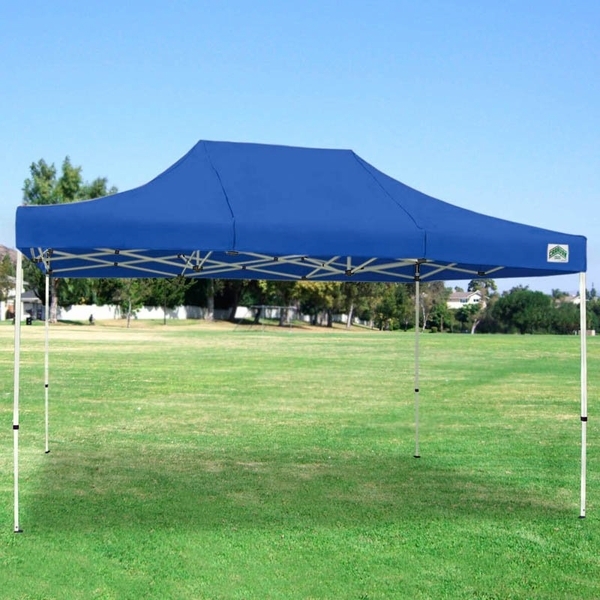 This comes in handy at softball or baseball games so you don't have to take down the canopy structure between games, but instead simply move it into the field area for the players to take a break from the sun. ProsThe size fits over the entire players bench for softball and baseball. ConsThe weight is heavy enough where one needs to use a cart instead of the carry case with wheels. I have used this canopy now at two events, great quality. Have several vendors make comments on the quality!! One person can set it up although two is much faster (2 minutes vs. 5 minutes). I'm glad I chose Caravan !! Canopy and top are constructed very well, look and feel durable. Would like to see a photo guide to setting the canopy up; we will be using this at a hospital for an emergency treatment area, photos always help when setting something like this up. I didn't receive a manual with the canopy either.